Scope out Sherburne’s wares at www.jennylouclayart.com and at Mica Gallery in Bakersville. Sherburne’s “mug tree,” with its curving stalk, creatively stores a collection of cups. 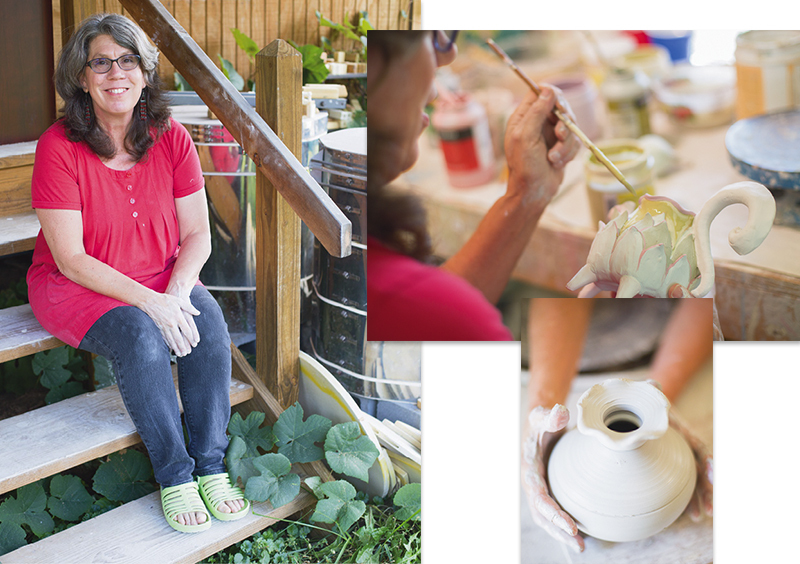 Sherburne creates from her home studio in Bakersville, where she makes, glazes, and electric kiln fires her wares. Sherburne embellishes her wheel-thrown pots using hand-building techniques and vivid glazes. These playful lotus teapots have leaf forms and lobes that highlight the plasticity of the clay. After creating shapes on the wheel (right), Sherburne experiments with extreme proportions and pops of bright color. You’d be forgiven if you mistook the whimsical pieces of potter Jenny Lou Sherburne for dishes from a tea party with the Lorax. The Bakersville artist, who moved to the area 12 years ago, decided early in her career to have a love affair with forms. Drawing inspiration from Dr. Seuss, Henri Matisse, and Antoni Gaudí, Sherburne expresses “growth, joy, and animation” in her work. “I want each piece to be a collaboration between me and the clay,” she says. Sherburne’s aesthetic education began in childhood, when she was raised in a Chicago house designed by modernist architect Louis Sullivan. The stained glass and wrought-iron features provided fodder for creative musings. A move to rural Kentucky instilled a love of nature evident in her work, which includes boxes designed to look like beetles and pitchers that call seed pods to mind. Sherburne enrolled in the clay department at Berea College, studying under Silvie Granatelli. “It was love at first touch!” she exclaims.